If you search for the best business blogs on Google you’ll get this result. It seems like most people looking for this term are looking for business advice. Today we’re going to look at the best business blogs about business and analyze what makes them the best. We’ll use an example for each of the reasons we think a particular blog is one of the best. The great thing about blogging is that it’s really just another form of creating content. 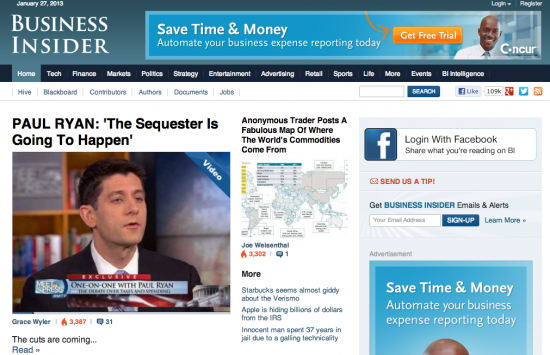 Business Insider understands that people like a variety of different content. That includes text, videos, images, etc. This site has it all. They tell stories with videos and images. They use photography to make a point in a post that includes tips for business leaders. This is one of the most popular business blogs out there and part of the reason is because they use all types of content. Go look at your favorite blog. Chances are they’re using a variety of different content. 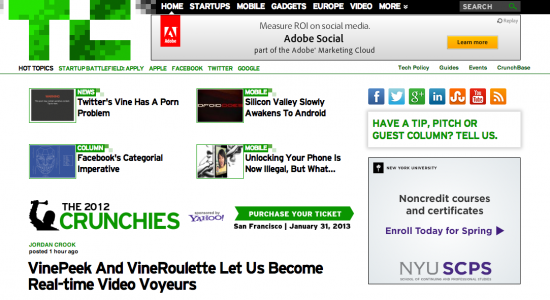 TechCrunch is hugely popular. One of the reasons is because they do good writing that people find interesting, but another reason is because they have an audience of tech people that love using the Internet. The site understands its readers and that’s who they focus on. Business people that are interested in online marketing read this blog. There are interesting stories about other business and what’s happening in the business world. It’s just a great site to stay abreast of what’s going on in the tech and online business spaces. 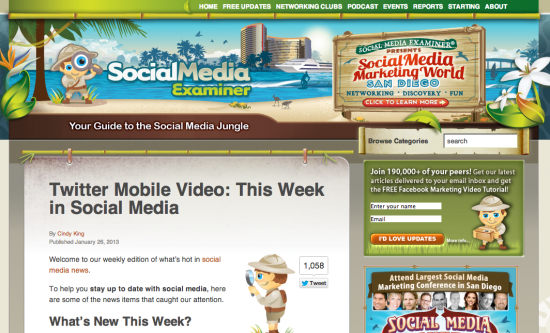 Social Media Examiner was actually started by a guy that used to write only about white papers. Michael Stelzner had this great blog about white papers, but it was so much more than that. I read it all the time so it was a natural transition to read SME. I’m going to use SME for the point about lists. Someone had to take this one home because nearly every successful blog uses a list at some point. We use them here on our blog. We use them for our clients. People love lists and it’s something that seems like it will always be true. The content has to be good, but if you can create a great list people seem to love it that much more. 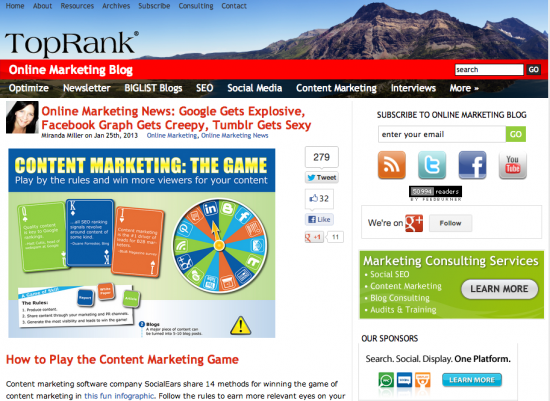 Top Rank Blog is the blog of Top Rank Marketing. It’s a consulting firm that helps businesses with everything regarding online business and general business strategy. This blog is one of the first I started reading. It’s been quite a few years now and they still turn out great content. What I’ve always loved about TRB is they mix what’s known as Evergreen Content with News Insight. The first is what you would call content that lives forever and has no timeline. That is extremely useful, but people also want to know what is going on right now and that’s where news insight comes in. TRB always talks about the latest happenings in content marketing, social media and online business. It’s always a must read for interpreting the biggest news in the business world. So much about business is telling stories. It’s a weird thing, but having a good product is not good enough. It never really has been. There has to be something for people to connect with and usually it’s a story behind the product or behind the company. 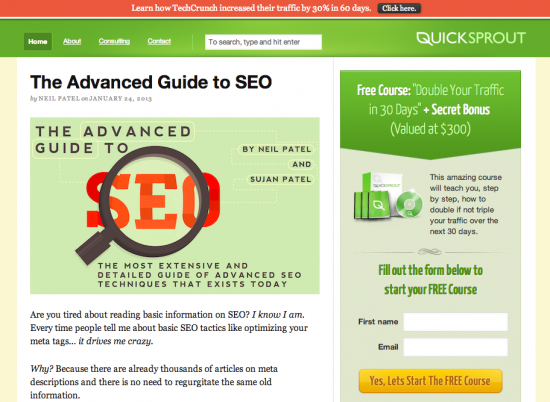 On Quick Sprout, Neil Patel tells his personal business story. The story is his, but he uses it to share tips and advice with other entrepreneurs. I read the blog myself all the time and have gotten some great ideas for my own business. Many blogs do this and the ones that are popular usually figure out how to tell stories with everything in their business including their blog. These have been five of the reasons or common traits of the best business blogs. If you look at your favorite blogs about business or blogs about anything you’ll see these common traits. Do you notice anything else about the best blogs out there?